I’m posting this Facebook conversation here because I think it outlines my reasons for favouring the Separatists and the Russians pretty well and things get lost on Facebook. I would like to call people’s attention to ‘The Sacker’s blog’ at http://vineyardsaker.blogspot.co.uk/ It is the best resource I’ve seen for getting updates on the Ukraine crisis. While I have no personal connection to Novorossia (a defiant name for the eastern provinces) the justice of their cause is obvious as is the injustice of the genocidal war against them. 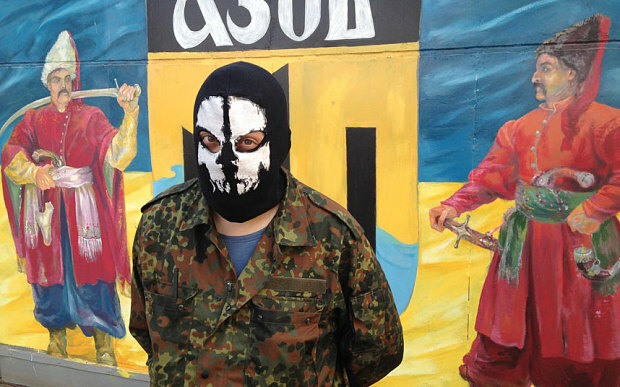 In a very real sense the Novorossia militias are fighting for all of us who are against the rise of fascism in Europe and the amoral and anti-rational politics of the US and EU. I urge everyone to keep an eye on this and engage in discussion about it as changing the consensus and the complacency is the only way we can support these people. I’ll admit to being not the most informed on this situation, but it seems like a stretch to say that the Ukrainian government is fascist because some of the protesters/militias involved in the euro maidan stuff were. Seem to me to be just the nature of mass movements, much like how you could encounter anti-Semite NWO freaks at Occupy. The Telegraph on the other hand is as mainstream as it gets and this article highlights the presence of fascist groups such as Azov fighting with the Ukraine army. Even the BBC acknowledges that the neo Nazi groups are a significant problem for, and through Svaboda in, the government. Looking deeper, Per Anders Rudling provides an interesting historical perspective on the rise of fascism and the divisions in Ukraine. I think he must be right in saying that the majority of Euromaidan protesters were not fascist and were protesting against extensive corruption but the fascists were a large minority and the best organised faction. At the end Rudling associates Putin with Yanukovich in ‘holding Ukraine back’; I think this is naive or disingenuous but he makes no argument for this. I watched the first two videos, will watch the 3rd in a bit. I don’t doubt that fascist militias have power in Ukraine but to frame the conflict and Russia’s involvement in at as anti-fascist seems wrong. Russia has their own self-interested agenda here as much the EU. The Crimean region seems to be in favour of secession and I support their right to self-determination, but I really don’t get your support for Russia and by extension Yanukovych’s government, which was clearly corrupt. I’m not suggesting Yanukovych was directly controlled by Russia, but he has their support. He is likely exiled in Russia despite being wanted for war crimes. Also, Russia has always justified their involvement by calling the Ukrainian uprising ‘a coup’. Despite the involvement of the far-right, this is dishonest. It was a legitimate popular uprising. Putin might be effective, but do you agree with the methods behind that efficacy? The protests started because Yanukovych backed down after Putin engaged in economic warfare against Ukraine to keep the country under Russian influence. That doesn’t seem very democratic or justifiable. I don’t see him as any better than the West. As for anti-fascism, I disagree. This is not clear cut ethically like people joining the international brigades to fight Franco in Spain…the fascists are by your own admission not in the majority. This is a civil war with strings being pulled by the West and Russia. It doesn’t make sense to me to pick a side. Serious analysts like William Engdahl and Stephen Cohen have shown that the ‘uprising’ was a coup and one engineered by the EU and US, with the US being less willing to compromise and agree on a Ukraine that would work with both the West and Russia. This is evident from the Victoria Nuland’s ‘F… the EU’ recording. It has also been reported that Maidan protesters were paid by the US and EU. Yanukovych is in exile in Russia but he is not guilty of the crime he is accused of, that is, using snipers to fire on protesters. Engdahl argues (and intercepted phone conversations between EU diplomats support this) that the snipers were working for the US who were intent on scuppering a deal being worked out between EU representatives, Yanukovych and opposition parties. According to Cohen, Putin made Yanukovych a counter offer and was prepared to work with the EU to rebuild Ukraine. It was the EU who forced Yanukovych to choose sides. I do see Putin as better than the West’s politicians; in demeanour, speech and action he is much more a conciliator and an incredibly competent manager which is entirely contrary to the aggressive, ‘thuggish’ picture painted of him in the MSM. Russia under Putin appears to be a very different entity to the Russia of the Soviet period or under Yelsin. Putin is by no means perfect and I don’t see him as the messiah but just as a really good headteacher can turn around a failing school he has been changing Russia and its role in the world for the better. Also worth watching this interview with Stephen Cohen who gives a very coherent account of the crisis describing how it was orchestrated by the US and EU. A quick look at wikipedia shows William Engdahl is a climate change denier and a guy who believes that oil is a ‘geological phenomenon’ that isn’t at risk of being depleted. I’m not sure that he is any more of a serious analyst than Alex Jones or David Icke. I see no reason to take his unsubstantiated claims that the Orange Revolution was instigated by the US as fact. These people seem incapable of understanding that while the masses are controlled, we are also capable of free thought and action and that real grassroots movements can exist. It reminds me of an article on infowars (one source of the claim the maidan protesters were paid) about London student protests in 2011 being infiltrated by anarchists who were actually agent provocateurs sent by the state. I had a good laugh at that since me and people I know personally organised that action. I’ve seen no evidence to support the claim of protesters being paid beyond a syndicated article on infowars and other conspiracy sites that quotes ‘a number of confirmations from readers’. I’ll finish watching these videos but these sources (Engdahl at least) are not particularly credible in my eyes. I’m sure that genuine grassroots movements were involved in the protests. But what good did their protests do? Why would they want to be associated with the fascist violence that accompanied the protests? Yanukovych and his government were bad but is the new government any better? I’ve found no substantial evidence of Maidan protesters being paid but there is no doubt that the US has been buying influence – sorry ‘supporting civil society’ – in Ukraine for two decades. Watch this short video of Victoria Nuland speaking at this ‘US – Ukraine Foundation’ conference. Did the US spend the admitted $5 billion over those two decades because they wanted to improve things for the Ukrainian people? Call me ‘symbol minded’ if you will but I was amused by the prominence of the US flag and the Chevron logo while the Ukraine flag hung limply in the corner. I’m certain that US aid comes with conditions that are tailored towards achieving the US’s geopolitical ambitions in the region. That is a different thing entirely from saying that they funded subversion, whatever that means in practice. This is a breakdown of US aid to Ukraine, most of which would be verifiable elsewhere (IMF etc.) – http://www.whitehouse.gov/…/fact-sheet-us-assistance… – America’s successful purchase of influence is no different ethically from Russia’s failed one. Vladimir Putin, ex KGB agent, ‘The Pariah’. 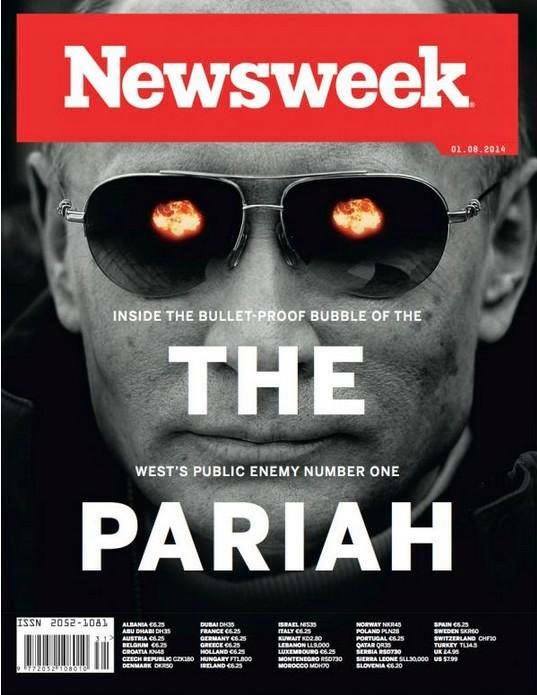 It sounds like a comic book supervillain, and that is how Russian President Putin has been portrayed in the west. When Malaysian airliner MH17 was shot down over the separatist held Donbass region of Ukraine on July 17, the Donbass militia were immediately blamed by the Ukrainian government in Kiev and by the US and its allies. By extension Putin and the Russians were blamed, accused of stirring up the ‘insurrection’ and supplying the Donbass militia with arms including the anti-aircraft missile launcher alleged to have brought down MH17. The mainstream media became a virtual lynch mob. It has been argued that there are inconsistencies in the metadata of the video suggesting that it was made prior to July 17. I don’t know enough to comment on this but I find it suspicious that this was posted to YouTube on the same day that MH17 was shot down and there is no information on the provenance of the video. The YouTube video was widely publicised and quoted in the mainstream media, the Twitter feed was not. Neither publication can be authenticated. But for Western politicians and Western mainstream media it was an open and shut case. It was left to the alternative media to challenge the prevailing narrative. 1. The video posted to YouTube shortly after the downing and purporting to be intercepted radio conversations between separatists is almost certainly faked. 2. Flight MH17 was diverted by Ukrainian Air Traffic Control to fly over Donbass, it was followed by a Ukrainian fighter aircraft and was ordered by ATC to a lower altitude within the range of anti-aircraft missiles. 3. The Ukrainians had anti-aircraft weapons in the area. 4. The recordings of the conversations between MH17 and ATC have not been released by the Ukrainians. 5. The US should have satellite images showing the movements of anti aircraft weaponry by the Kiev forces or by the Separatists but they have not shared this. Lee notes that the Russians have produced a great deal of intelligence supporting contentions, such as those noted above, that challenge the US narrative whereas the US has been dependent on postings to social media. It consisted of satellite imagery and Air Traffic Control tracking. This evidence revealed the presence of Ukrainian anti-aircraft missiles on the ground within range of MH17 and a Ukrainian combat aircraft flying near MH17. The US contention that they had photographic evidence that a missile system was moved from rebel territory to Russia after the downing of MH17 was challenged on the basis that a photograph was taken in Ukraine controlled territory. The Russians challenged the US to present their own satellite imagery given that the US has been closely monitoring the region. So far no such evidence has been produced by the US nor have they challenged the Russian evidence. As of August 5 no forensic evidence has emerged to support the narrative that MH17 was shot down by the separatists. But current evidence points to the Ukrainian government as being responsible and is more consistent with the @spainbuca Twitter posts than the intercept recordings posted to YouTube. MH17 video report deleted by the BBC – ENG subtitles from trodas on Vimeo. When will western governments and their media concede that their narrative has unravelled and rethink their judgement on Russia and the separatists? How will their approach to the Kiev regime change? Will Vladimir Putin still be ‘The Pariah’?